World Bank CEO Kristalina Georgieva on 4 November assured complete 'unwavering commitment' and support to fuel India's growth momentum, adding that New Delhi's success translates to global success. Addressing the 'India's Business Reforms' session at Pravasi Bhartiya Kendra earlier in the day, Georgieva, citing India's 30-place jump in the 'Ease of Doing Business' report said such an elevation is 'very rare', especially given the size of the Indian population. "India has achieved remarkable overall success. A jump of this nature is very rare, especially in the case of India, with such a large population. Seeds sown of simplification, reduction of administrative barriers, enhanced use of technology, and feedback from end users have resulted in the success. . In reforms, what pays off is persistence. What we are seeing is extraordinary achievement by India. This needs to translate to more reforms for the future," she said. Hailing the Goods and Services Tax (GST), Georgieva stated that the system of a unified internal market creates an incredible growth opportunity for India. This, she said, is being supported by the development of high-quality infrastructure in India for enhanced connectivity, along with efforts in the areas of health, education, sanitation and investing in roping in more women into the workforce. "India's federalism should work for India. The foundation of India lies in the strength of cooperative and competitive federalism," she said. 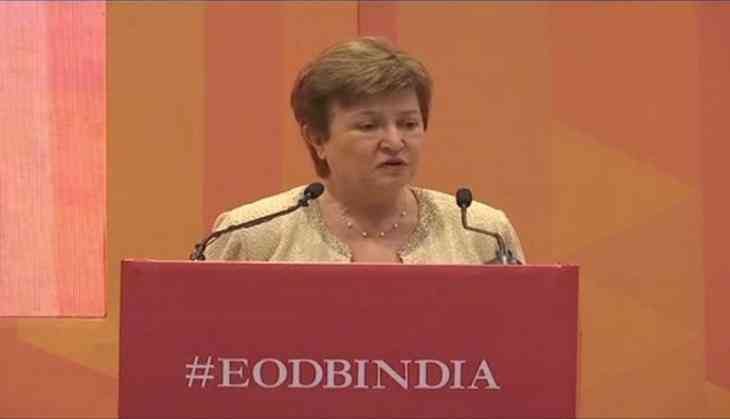 Highlighting the four-fold increase in per-capita income, and two-fold growth in FDI inflow (36 billion in 2014 to 60 billion presently), Georgieva stated that the need of the hour is to retrospect upon the size of firms in India, and chalk out measures to enhance capacity in order to create more jobs.